Test your “thrill factor,” get that adrenaline pumping, and let the fun begin. For a getaway with more thrills than you ever imagined, head to Six Flags Darien Lake, New York’s largest Theme Park and Resort. It is the only Six Flags resort featuring 100 rides, shows and attractions, three on-site lodging choices, a water park, kids park and Performing Arts Center. Six Flags Darien Lake is located between Rochester and Buffalo, New York, just off the New York State Thruway. Check your cares and inhibitions at the registration desk and set yourself free. Free to test your fear limits… your scream power… your thrill factor. Nothing gets the adrenaline pumping and the blood coursing through one’s veins like the coasters. 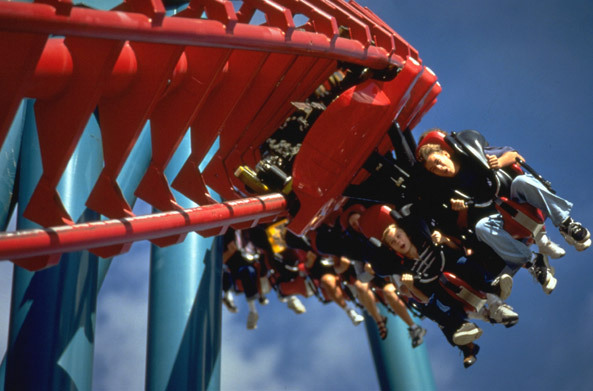 Faster than the legal speed limit, Superman Ride of Steel, at 208 feet, is one of the tallest, fastest roller coasters in the northeast and hurls passengers along at 72 mph! Talk about hanging around! The Mind Eraser is the only suspended roller coaster in New York State. Passengers soar over 10 stories skyward reaching speeds in excess of 60 mph. Experience the creak, groans, screams, and shimmy of The Predator, the tallest wooden coaster in New York and one of the top 10 wooden roller coasters in the world! Ten hair-raising drops have earned it international acclaim. Still not had enough? Head to the Viper, the first roller coaster in the world to turn passengers upside down - five times! Take the change out of your pockets before you drop 75 feet, go through the 360-degree loop, the double corkscrew, and the boomerang curve at 50 mph! At the water fun park, if you are not wet you are not having fun. 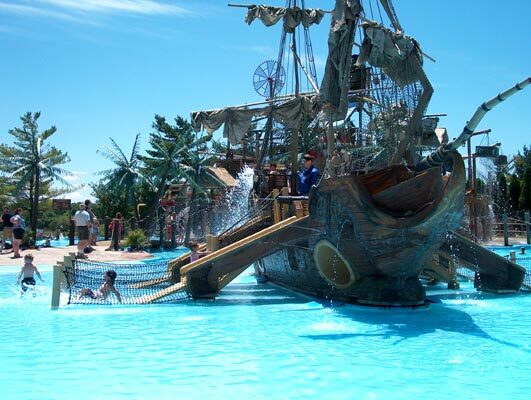 Getting wet is no problem thus the fun continues at Barracuda Bay with five water slides, the Crocodile Isle wave pool, and Hook’s Lagoon, an interactive family water attraction with a three-story tree house and 150 aquatic features. 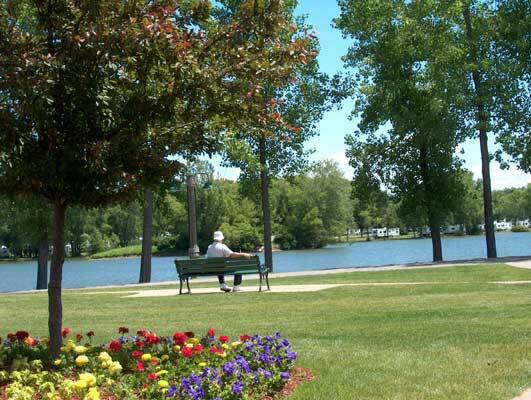 Of course, you could just laze by the water with a good book. You could, but how long do you really want to do that, because there is more. Much more. Six Flags Darien Lake has 42 adult rides, 26 kiddy rides, and an 18-feature water park so plan to spend a couple of days. A couple of super-special thrills have a separate fee – the Skycoaster, a combination of hand-gliding and parachuting; the Slingshot that catapults riders up to 300 feet in the air, and the Turbobungy that allows guest to propel themselves 20 feet in the air with the air of four trampoline pads. Try them all – if you dare! At the “Batman Thrill Spectacular” cheer on the Caped Crusader and Supermodel Jennifer Morgan as they take on the Joker and his evil henchmen. Motorcycles roar across the stage with the Batmobile in hot pursuit during this action-packed, stunt-filled show complete with special effect and pyrotechnics. Travel along with “Bugs Bunny and Friends” as they go to Hollywood. The live show features the antics of the Looney Tune characters on the set of Bugs’ latest movie. Stay around to meet and greet the characters: Bugs, of course, Tweety, Sylvester, and their Looney Tune buddies. It rocks! Get ready to sing and dance at “American Pop,” a new musical production, that combines music from the 50s with contemporary hit songs. Or, how about some “Rockin’ Country” music that will have you line dancing and a-clappin’? End the day with a blast… Laserblast! 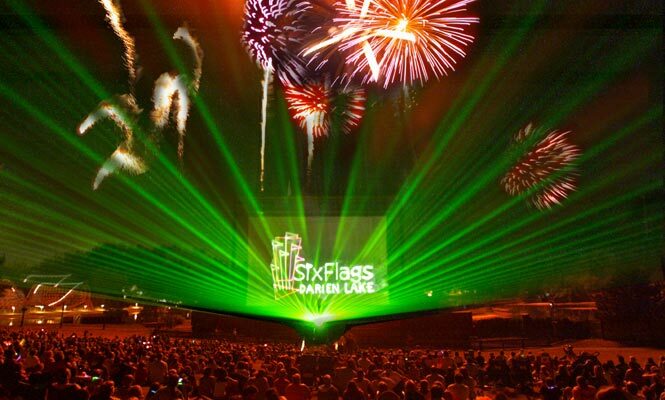 Spread out your blanket on the grassy hillside for the nightly state-of-the-art Laserblast that combines fireworks, pyrotechnics, laser animation, light, sound and music. What a dynamite way to end the day. If the excitement get too overwhelming, when your psyche needs readjusting or just slowing down, walk around the tranquil pond or just sit and enjoy a moment of serenity. You can even fish a bit. What is more relaxing that that? Or, laze around the pool. Just relax and ready yourself for another round of thrills. Chose between a 162-room timbered Lodge on Lake, with a heated swimming pool. Or, camp out in the 1200-site campground in one of Darien Lake’s 430 recreational vehicles. Each 34-foot RV can accommodate up to six people. Or, bring your own tent or camper. All accommodations packages include theme park admission with unlimited rides, attractions, live shows, and free parking. With Subway, Beaver Brothers Lakeside Café, fudge shops, hot dogs and more you’ll never go hungry. Deep discounts apply for season holders. Off-season discounts are available plus discount tickets can be purchased at Wegmans Food Markets. All day admissions range from $18.99 for senior citizens to $31.99 for all-day adult admission. Save by getting your tickets on-line. For more information on Six Flags Darien Lake, check www.sixflags.com/darienlake or call (585) 599-4641. Ask about their special events, which range from Physics Day to Mardi Gras Celebration to October’s Fright Fest. The thrills are addicting, so as you drive away and begin to suffer from withdrawal, get another shot of thrill seeking. Stop in Niagara Falls, New York and test your Thrill Factor some more. Start with Cave of the Winds where you get drenched with tons of water from the American Falls, then feel the power of the Canadian Horseshoe Falls upclose and personal as the Maid of the Mist motors to the foot of the falls. But the final Thrill Factor test comes on the Whirlpool Jet Boat, www.whirlpooljet.com, (888) 438-4444. 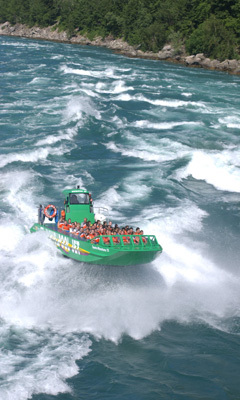 The powerful Jet Boat speeds up the Niagara River through the breathtaking stonewall canyon of the Niagara Gorge. The anticipation builds as the boat crashes and splashes through the whitewater of Devil's Hole Rapids. The ultimate destination is the legendary Whirlpool, just a half-mile below the tumbling waters of one of the wonders of the world, the mighty Niagara Falls! Darien Lake, along with Niagara Falls, is the best place to test your Thrill Factor!